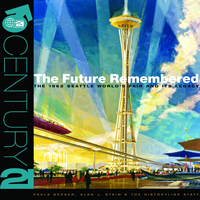 The Century 21 Exposition (also known as the Seattle World’s Fair) captured America at the peak of Cold War tensions, on the cusp of a cultural revolution. Behind the fair’s glitter and diplomacy was a larger vision, as civic leaders, elected officials, and public citizens who built the fair’s success vowed that when the lights went out and the tourists went home, Seattle would be left with a much-needed civic center. In the half-century since the fair, Seattle Center has become the artistic and cultural hub of the city — the brilliant and remarkable legacy of a fondly remembered six months in 1962. ISBN-13: 978-0-615-46940-9. Published by Seattle Center Foundation in association with HistoryInk/HistoryLink.org, 2011.